Home Headlines & News WITB John Daly – What Is In His Bag? WITB John Daly – What Is In His Bag? THP gets asked about a lot of different players and what they have in their bag during events. The THP Tour Spot is the one place you can go and find information on many players and what is in their bag each and every week. Readers can also join in on the forum and request certain players so that they never miss a beat. One player that we get requests for a lot is that of John Daly and this last week at the Puerto Rico Open, THP got a profile of everything that he is currently playing. For the last several tournaments it appears as though Daly has settled in on his wedges for use and gone with the Cleveland line including the pitching wedge. He is a guy that has experimented with a ton of different options and seems to have settled on these. You can discuss this bag or any other Tour Spot profiles in our THP Forum right here. I’ve always kinda wondered about him. He seems like he would play clubs based on ego rather than need. Just from what I saw from him on his “reality” show. Dude looks burnt up. Like crispy, but not extra tasty. 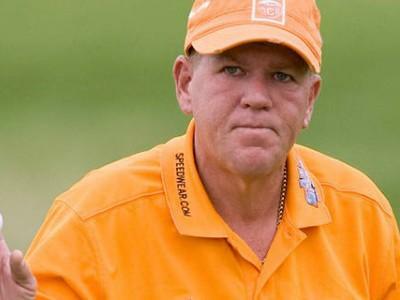 Like him or not, that John Daly can move the needle. He’s got a cult like following and it’s interesting to see what he has in his bag. I that HP put out an article that Big John was signed with Bettinardi to play their putters? He switched that fast? Or is there an Uh-oh on the horizon? He switched out of the Bettinardi to the Method a couple of tournaments ago. His putting has not improved ironically. I can’t believe that we are discussing JD. I thought that was taboo and he wasn’t even really recognized as a professional golfer. Bottom line is that he looks like an interstate billboard 1/2 the time…. Looks like he really went with a great set up. WITB for JD is not about the clubs. What is really in the bag? Let’s see, a TV, smokes, couple of fancy lighters, bitters, couple of old custom mickey bottles, rubbers, stir sticks from Mustang Two in Las Vegas along with some $100 chips from the Gold Coast…anything else? Heya i’m for the primary time here. I came across this board and I find It truly helpful & it helped me out a lot. I hope to offer one thing again and aid others such as you aided me.